Mount Doom, originally uploaded by skarpi. View Big On Black is better for your eyes and soul. Mount Doom - Volcano Eyjafjallajökull on the 13.th of mai. 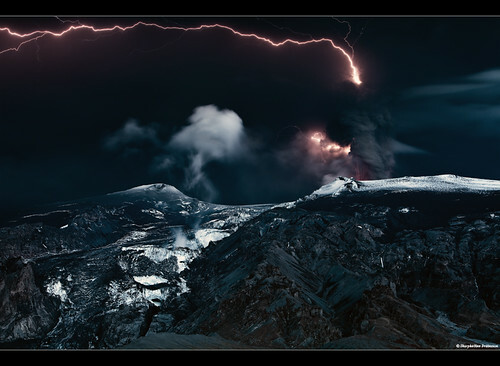 Thunders and lightnings striking through the black ash moody sky above the erupting crater. Steam "skull" figure rising from the melting Gígjökull glacier while 1000°C hot lava bursts it's way down the glacier.